God tells Moshe to assemble the community, order a rock to yield water, and water will arise. But what Moshe does is a little bit different. He assembles the people, he says “Shall I get water for you from this stone? !” and he hits the rock with his stick. Water does arise, and the people drink — but God is angry, and for this transgression Moshe is barred from entering the promised land. I believe that the reason Moshe doesn’t enter the Land is that the journey is more important than the destination. It’s important to have a destination to strive toward, but the real work of the spiritual path is to find holiness in the journey itself. That said, this week I’m interested in Moshe and why he whacked the rock with his stick. As the mother of a sometimes willful toddler, I feel empathy for Moshe as he listens to the people moan and wail. He’s dedicated himself to caring for these people and helping them “grow up” from a slavery mindset to one of freedom and covenant, but do they appreciate him? No: they take every opportunity to yell at him, to stamp their little feet and sit down on the sand and refuse to budge. Moshe is burned out. And in a moment of exhaustion and overwhelm, he responds to the people’s negativity with negativity of his own: whaddaya want me to do, dammit, squeeze water from this stone? Maybe as he looks at the stone he’s thinking of his own heart, which right now is feeling dry and unwatered, baked hard as rock. This year, I find in this parsha a message about self-care. If we ensure that our own emotional and spiritual needs are met, then we become able to respond to those who need us with generosity and compassion. That’s when we can use words to work magic — to cause sustenance to flow where none was there before. This is the d’var Torah I offered at last night’s religion committee meeting. You can find my other divrei Torah on this portion in the Velveteen Rabbi Torah Commentary index. Following that article is a short and fascinating survey called “The God Survey – a survey of the personal God beliefs of Reform Jews,” the results of which will be reported on in a future issue. Thus far, over 1000 people have taken the survey. If you haven’t yet filled out the survey and would like to be part of the official results, the RJ magazine staff asks that you please take a couple of minutes to complete it. To take the survey, go to https://www.surveymonkey.com/s/thegodsurvey It’s fascinating, and will really make you think — I was surprised by some of my own answers, and hope that we can use some of our time during Torah study on Saturday, July 7 to discuss it further. Additionally, Torah study that day will include a discussion about angels and particularly the angel of death in Jewish tradition. This will include the showing of a short and fascinating “Mockumentary” about the Angel of Death that will provide a lot of food for thought. If you can’t make it for the Shabbat service, feel free just to come for Torah study at approximately 11:15 AM on Saturday, July 7. First Friday Potlucks at CBI! 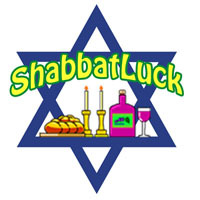 On the first Friday of every month, there is a family-friendly potluck (or “Shabbat-luck”) at 5:30pm. Kids of all ages (including grown-ups!) are welcome. Bring a vegetarian or dairy dish to share; we’ll provide the challah, grape juice, and candles to bless. Feel free to RSVP to Leehe Shmueli (religiousschool.cbi@gmail.com) so we’ll know what you’re bringing… but feel free to come even if you don’t RSVP; the more, the merrier! Join us to ring in Shabbat with joy! 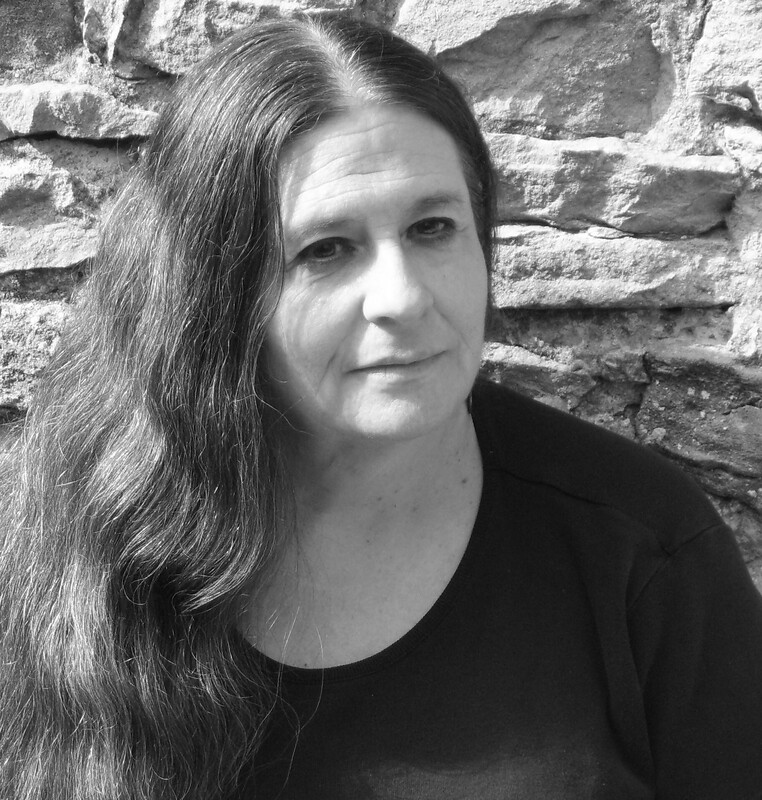 Don’t miss this opportunity to hear from Merle Feld, a widely published poet, award-winning playwright, peace activist and educator. She is the author of Finding Words, (URJ Press, 2011) and the highly acclaimed memoir, A Spiritual Life: Exploring the Heart and Jewish Tradition (SUNY Press, revised edition 2007). 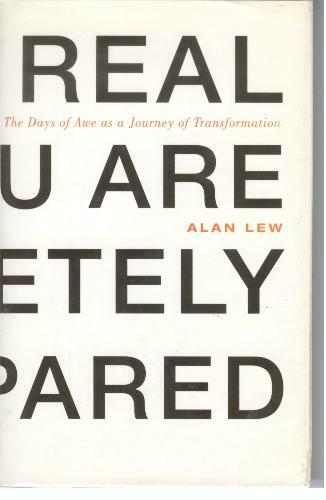 If others are interested in reading this book and meeting a few times to discuss it, I would love to do that! For the final chapters of the book, which cover the Ten Days of Repentance and Yom Kippur, I’ll encourage members of the discussion group to meet on their own in “hevruta” — groups of two or three — to discuss these chapters sometime during those Ten Days. The 4th of July at CBI! and any outdoor games you like. PLEASE RSVP to joranzer@gmail.com ASAP! Let Joanne know what you plan to bring. 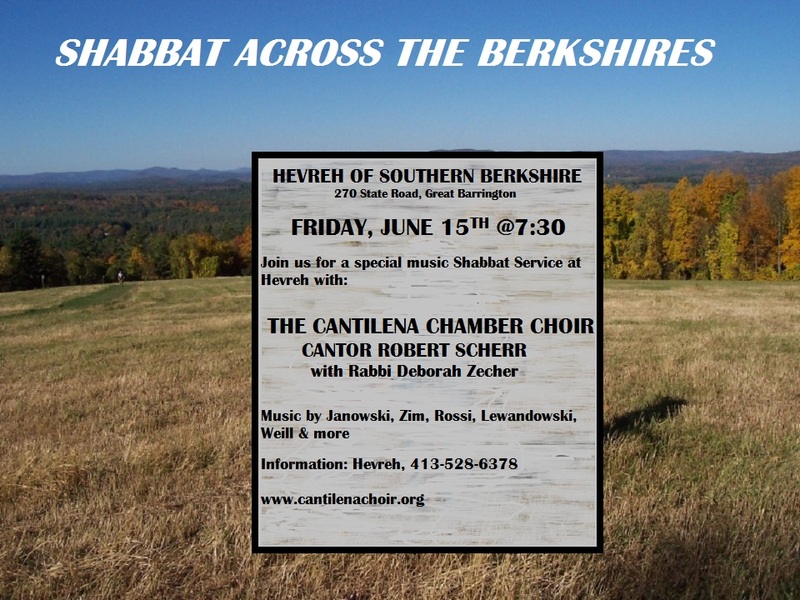 The Berkshire Jewish Music Festival will present a Shabbat evening service featuring old, new and rarely heard music from the Friday evening Jewish Liturgy. The service is free and open to all religious faiths, and will be held on Friday, June 15, at 7:30 p.m.
Cantor Robert Scherr, the co-director of the Jewish Music Festival and a chaplain at Williams College, has collaborated with Andrea Goodman to bring this unique event to Berkshire residents of all religions as a showcase of the great traditions of synagogue music. Cantor Scherr will join the choir the Choir in presenting monumental of works by the great composers from the European school of music (Rossi, Sulzer, Weill and Lewandowski) and the American school (Benji-Ellen Schiller, Ernst Bloch, and Sol Zim). The Cantilena Chamber Choir is under the artistic direction of Andrea Goodman who is also the Director of the Northern Berkshire Chorale in Williamstown and the Saratoga Choral Festival, an annual summer concert series for chorus and orchestra in Saratoga Springs, New York. Enjoy this special celebration of Shabbat, adorned and illuminated with song!